(Die Gestalten Verlag, €39.90, USD65, £35). A tree grows from the belly of a surprised-looking corpse, straight through the lid of his glass coffin, overlooked by a casually dressed skeleton giant, emerging from the dirt of a graveyard. Sad-eyed madonnas share glances, tongues and even intestines with stylish death’s-head angels. Poor dwellings are painted with rich and colourful patterns, letters and potent imagery: chalices, flasks, thorn crowns, hexagonal eye sockets and crucifixions. Welcome to the dizzyingly visceral world shown in Calma, The Art of Stephan Doitschinoff. Brazilian artist Doitschinoff (b. 1977) has had a second life as street artist Calma, yet his work is light years from the urban taggers of New York City and nothing like the pichações (see Eye no. 56 vol. 14) of São Paulo, where he grew up. 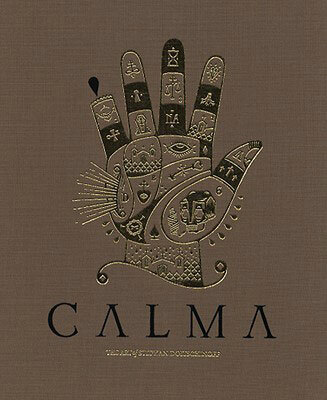 In an interview with Tristan Manco, Doitschinoff explains that the literal meaning of his pseudonym is ‘calm down’, but that it also comes from con alma / c’alma, meaning ‘with soul’. Doitschinoff, raised in a fundamentalist Christian family, may be a non-believer but queasy, quasi-religious imagery runs rampant throughout. The book’s design is by Pedro Inoue (see Eye no. 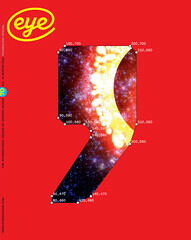 68, p.63), who has typeset the book using Gill’s Perpetua Titling and Barnbrook’s Priori Serif. 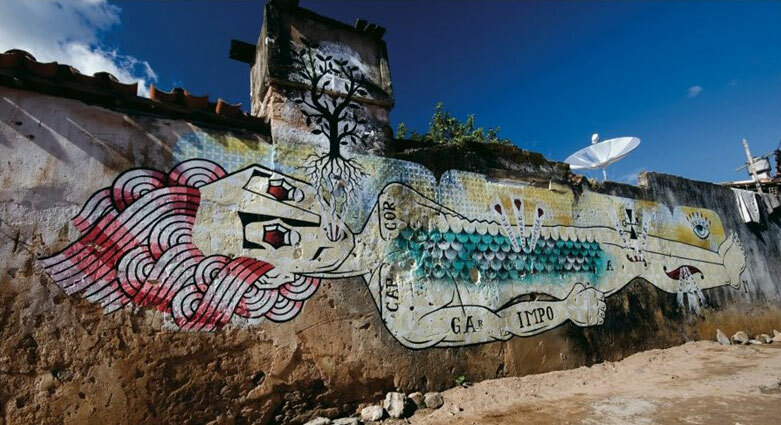 In addition to Doitschinoff’s drawings and paintings, now starting to attract high prices in swanky galleries, we see his murals in villages in the Bahia region, where he became an unofficial community artist in villages such as Alto da Estrela, Tomba Surrã and Lençóis. A section titled ‘Tales’ recounts his experiences with the locals: moving, funny and alarming by turn.